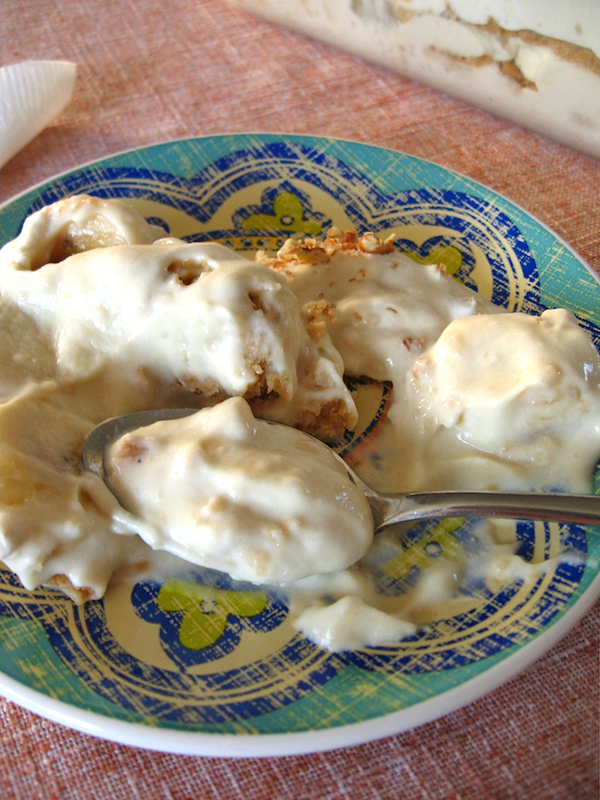 An intense craving for creamy banana pudding hit last week and would not relent until I got to enjoy it again. Quite a popular dessert back in the ’80s, it had been years since I had gotten my fix. Back in the day, vanilla cookie wafers were very popular and were central to the pudding’s success. Thankfully, I have discovered how to make vanilla cookie brittle that is remarkably like those boxed wafers I used to dunk in milk. Were you a ‘Nilla wafer fan too? The cookie brittle comes from my gluten free Pomegranate Gem Orange Bars recipe. But this dessert is a little simpler because there’s no need to bother making a crust. Once the cookie layer is baked and the homemade pudding has chilled, just layer the pieces of cookie brittle with fluffy pudding and fresh banana slices. Chill for a few hours (or overnight) and you’ve got classic banana pudding flavour without the gluten and dairy. Addicting, yes, but it comes with the satisfaction that you have made it all from scratch. And crowd-pleasing desserts like this are ideal for bringing to picnics, potlucks, and family gatherings. 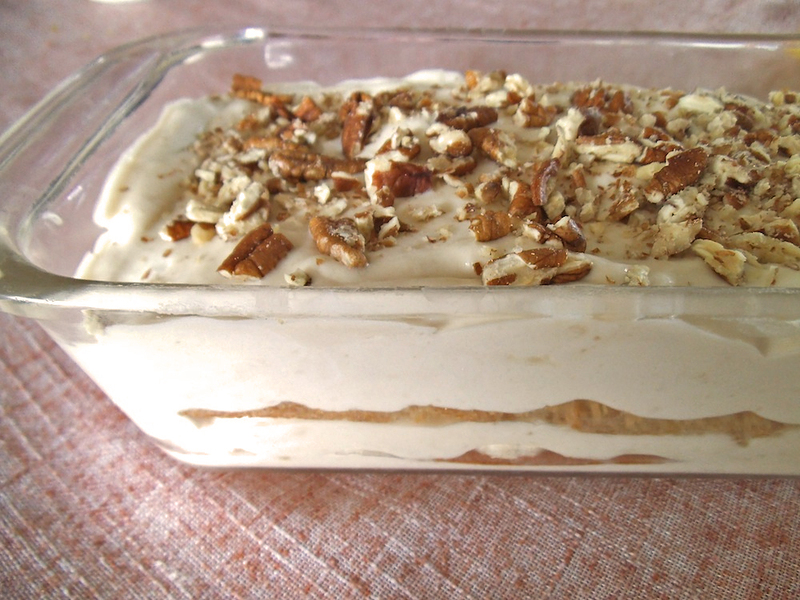 Or you can make banana pudding simply because you are feeling nostalgic, like me. To make the pudding, whisk together salt, cornstarch, and sugar in a medium saucepan. Slowly whisk in coconut milk and cold almond milk. Turn on heat to medium and bring the milks to a simmer, stirring constantly. If using egg yolks, take 1/2 cup of the hot liquid and whisk with the egg yolks in a separate bowl until smooth. Return warm mixture with egg yolks to the saucepan with the pudding. Simmer for 5 to 7 minutes, until thickened. Stir in vanilla extract and remove from heat. Transfer to a medium bowl and cover with plastic wrap. Chill until cool, at least 45 minutes. Fold in whipped coconut cream. To make the gluten free cookie brittle, preheat oven to 325 degrees F (170C). Whisk together egg whites with sugar until smooth. Whisk in oil and extracts. In a separate bowl, whisk together rice flour, almond flour, salt, and baking soda. Combine wet and dry ingredients and stir until smooth. Line a baking sheet with parchment and grease it lightly with oil. Spread cookie batter out in a thin even layer to form a rectangle. Bake for 15 to 18 minutes, until edges are crisp and deep golden and middle is set. Let cookie brittle cool on the baking sheet. Score with a knife to form 6 smaller rectangles. Use a metal spatula to carefully lift each piece off of the baking parchment. To assemble the cake, spread about 1 cup of pudding mixture into a 9 x 5-inch loaf pan. Top with a layer of cookie brittle (it’s okay if this is not crisp), trimming the rectangles to fit if neccesary. Slice one banana and place the slices on the cookie layer. On top of the banana layer, spread another cup of pudding mixture, followed by another cookie layer. 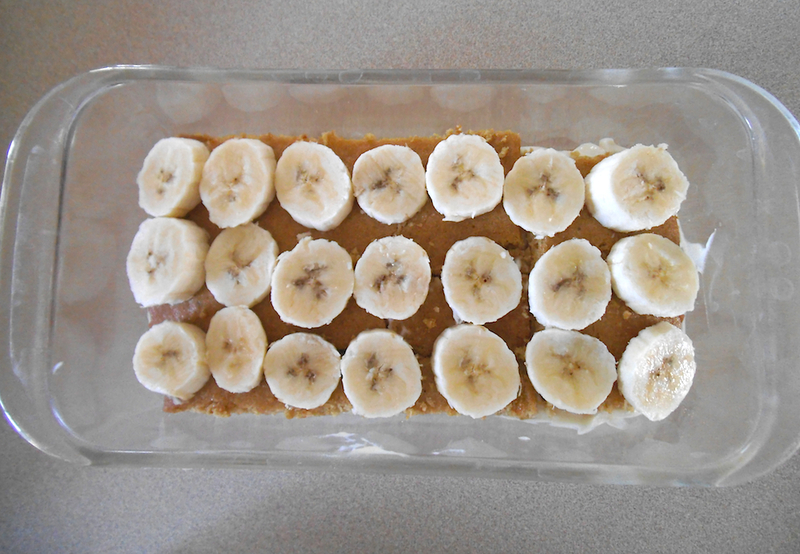 Top the second cookie layer with another sliced banana. Finally, spread remaining pudding mixture on top. Sprinkle with chopped pecans. Cover the pan and refrigerate for 2 hours or more. Serve cold. I’m bringing this dessert to Fiesta Friday this week. Also shared at Allergy Free Wednesdays and at Gluten Free Wednesdays. I share recipes here as well. Oh, a gluten free version! Yum, I love banana flavor so I’ll definitely make this! Thanks for sharing. Now I know what icebox cake is 🙂 I’m adding it to Stumble Upon! Why thank you! It tastes wonderful too. A nice change from banana bread. That cookie brittle sounds amazing! Lovely recipe. This looks just so deliciously creamy! This looks amazing! Never had anything like this before (not something we have or had in the UK I don’t think! 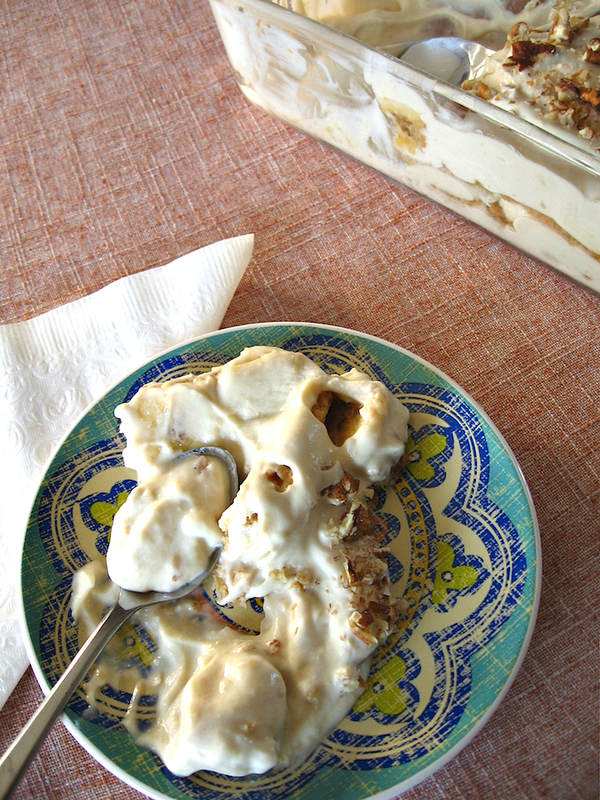 ), the closest is banoffee pie, but I love the vanilla brittle in this, it sounds delicious! Thank you for bringing it to FF! And it tastes even better. 🙂 Freezes well too. I confirmed that today. 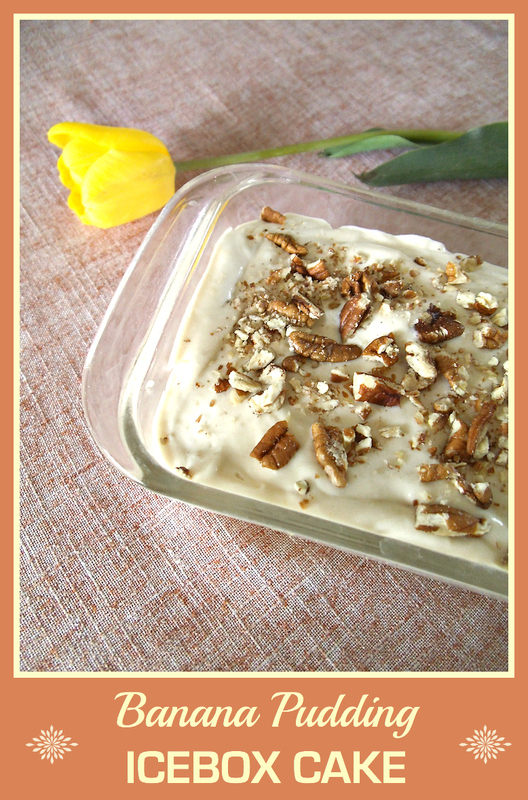 My mom used to make homemade banana pudding when I was a kid–of course she had Nilla wafers in there as well. Now I wanna make some! Thank you for sharing your recipe with us at Merry Monday!